Home improvement projects are among the most stressful things to work on. Months spent on planning can go down the drain if handled incorrectly. It is not just time that is wasted when home improvement projects end in disaster; hard-earned cash can also go down the drain quickly if you are not careful. This is the reason most home owners that want to improve the appearance of their house, increase its’ value, or turn it into the dream house they always envisioned would call upon the services of a contractor in Frisco TX. One of the things that you should do is to look up (research) the particular contractor in Frisco TX that you wish to hire. Obtain as much information on them as you can. You should determine if the contractor is honest and reliable to ensure that the work will get done properly and that you get your money’s worth. When possible, ask your friends or other people you know who they hired when they had a home improvement, remodeling, or repair job that was similar to the one you intend to do. Ask them to tell you about the contractor they hired and how satisfied they were with the contractor’s work. Other sources of information to consider is the Yellow Pages and looking up the contractor online. These days, it is very easy to look up references for the contractor in the form of reviews. Read the reviews and also look to see if there are any complaints filed against the contractor that you intend to hire. Don’t just look at the reviews found on the contractor’s website, look also for reviews in Google, Yahoo!, Bing, Thumbtack, Houzz, MerchantCircle, CitySearch and elsewhere. You might also want to check and see if the contractor has a presence on the Social Media sites like Facebook, Google+, and Twitter. Another good idea is to compare contractors and their prices. The best way of doing so would be to call them up and provide all the important details you can about the home improvement, remodeling, or repair project that you wish to accomplish. Be sure to provide the exact same detail to each and every contractor you are interested in hiring. That way, you can easily compare their prices and you won’t end up doing an “apples and oranges” comparison. When selecting the best contractor for the job, don’t just look at their proposals, but also on how they intend to accomplish the project – what kind of materials they will be using, and the quality of work they will be doing. The cheapest estimate is not always the best choice. After you have selected a contractor in Frisco TX for the job, be sure to read the contract between you and the contractor very carefully and thoroughly. If there is anything in the contract you do not understand, do not hesitate to ask. You are, after all, the customer. Make absolutely certain that the contract includes information such as: the specifics of the job you hired them to do, the clean-up and debris removal, and the guarantees they offer. As a final word of advice, it is best if the job is not rushed. No matter how urgent a home improvement project can be, it is not wise to rush because quality is often sacrificed in favor of expediency. Ask yourself this: Is it more important to get the job done right or get the job done in a hurry? Often, the job can be done quickly and correctly. But, which is more important to you when decisions have to be made. 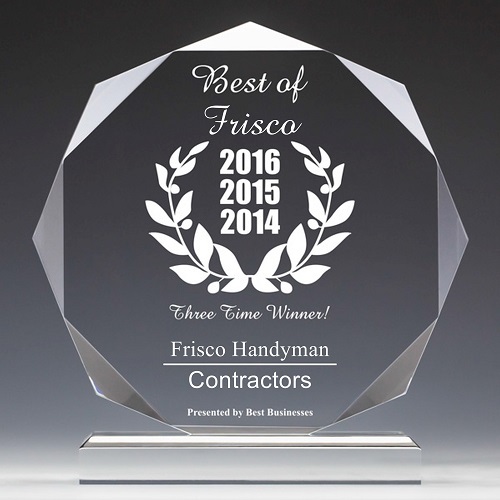 At Frisco Handyman, we pride ourselves on the quality of our workmanship.